EIP Insert Pack - made of polypropylene (hard plastic). 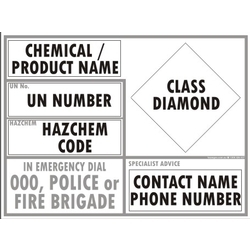 For use with EIP PVC Banners with pockets from Hazsigns. Pack includes 5 custom inserts - CHEMICAL/PRODUCT NAME, HAZCHEM CODE, UN NUMBER, CLASS DIAMOND, SPECIALIST ADVICE DETAILS. Please provide relevant information after ordering.